We all know about BPA in babies’ bottles but it seems to be in just about everything, including the bowls and spoons we use for feeding. I was so excited to find a range that is not only BPA-free and organic but actually made from corn! 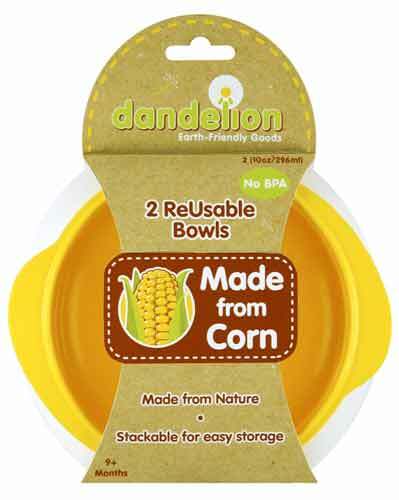 Dandelion feeding utensils are made from a unique corn bioplastic (PLA) formula which is naturally BPA free, Phthalate free and PVC free. Corn is also a renewable and sustainable resource making this product earth-friendly as well as people-friendly. Dandelion feeding bowls are a lovely size and perfect right from first foods through to slightly bigger meals (I had my yoghurt out of one the other day). They are fairly deep which reduces spills and have little handles on the sides so they are easy to hold. Their spoons are great – small enough to fit into baby’s mouth easily with long handles to reach into deep jars. They also come in a pack of 8 so you can keep one in the nappy bag, one in the car and one in the handbag for all those out and about meal emergencies, and still have spare at home. You must remember that this range cannot go in the microwave or dishwasher, but they are pretty easy to clean so that’s not really an issue.